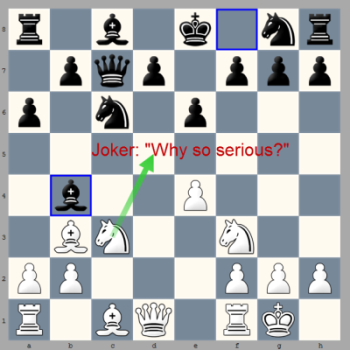 Do you like games, which are as early as move 8 out of any chess theory (e.g. not covered by ChessBase Mega Database 2012)? Sacrificing a knight at move 9 for seemingly nothing? All engines claiming you are crazy just to change their mind completely after a few moves? Read on and enjoy this Morra tale! I’m not only the author of CPT, but an active chess player too. Actually, in first place I wrote the software for myself (in 2004) to improve my opening play. I played the following game (my first Morra ever) at board 3 in a match of the German NRW Verbandsliga. This is not a league, where you dare to play nonsense. My opponents rating was 2000 DWZ (approx. 2100 ELO). Although CPT played an important role to learn the opening, it is not the topic this time. The game gives much space for delving into amazing analysis. While analysing the game at my chess club we could hardly stop. It perfectly shows the richness of the Morra gambit. A man called Marc Esserman made me a Morra convert. If somebody would have told me in December 2012 I’m going to play the Morra Gambit in a game with standard time control soon (or even post a game of myself here), I would have laughed about him. Now, exactly this happened in February 2013. It all started when I heard about a new chess book called „Mayhem in the Morra“. I already read quite a few chess opening books. Usually, gambit books are fun to read, but they don’t offer an in depth and objective analysis. Some reviews gave me the impression that the book by Esserman is different. I bought the book and couldn’t stop reading it. Even if you never play this opening this is an outstanding work of labor and love you should check. Fantastic analysis and entertaining in a unique way (Chris Wards books are quite fun to read, but this one goes beyond that level). Unfortunately, there is no ebook available (my only complain). So I had to enter the complete opening into CPT manually. Well, it also helped me to understand the opening and there is much more than forced lines to learn as you will find out by reading the book. My first Morra and already a tricky move order, which I haven't seen before in quite a few online games (keep in mind I have been playing it for just a month though). It is also not covered in the already mentioned Morra bible by Esserman. Qe2 is the most intuitive and a typical Morra move for white. However, the queen is already on the c-file and a rook on the d-file is less effective now. Esserman also teaches in his book not to follow the standard Morra moves in all cases. More importantly: I knew that after Nc6, 8.0-0 Nf6 I can play Nd5 (coverd by Esserman, which I remembered). So, I opted for this continuation. Well, many chess players will know the sacrifice motif of playing Nd5 with a rook already on c1. While reading Esserman’s book I learned a new way to sacrifice the knight and that is without any rook on c1 and no „I get my knight in two moves back“ forced line. So, in the position I decided to execute one of the most amazing sacrifice motifs in the Morra by playing Nd5 although I certainly was not able to completely analyze all variations. I decided to play it nonetheless while on my mind the soundtrack of some movie were playing (and some famous cinema quotes like “why are you so serious?”). You think I became completely mad? Read Esserman’s book and you will know. On a side note it is amazing how he managed to encouraged me to play such a move partly by his writing style. I believe my opponent thought I'm kidding. He spent only a few minutes on this move, but I guess as he saw that Re1 is not possible, he felt quite comfortable. How to continue? Any ideas with Re1 fail due to the bishop on b4. Furthermore it is not possible to push him away from the a5-e1 diagonal. And 12... Qd6 13. Bf4 Bc5 14. Rfe1+ Kd8 15. Qxg7 +/- doesn’t look good either. After the game one of my team mates explained to me that he told my other colleague he really likes my position here. That was before he made him aware that I'm a whole piece down. Well, who is counting pieces in the opening? I believe it was here that my opponent realized that Nd5 was no nonsense. He spent quite some time on his next move and decided to give back the piece. Another amazing move, which your chess engine won't suggest, but one of my teammates insisted on in the after-game analysis. This is a real killer move. Black still can't take the knight although even the Bishop will hang (I wish I would have realized that during the game, but it takes some moves even for a strong chess engine to appreciate this move). Now, the c-file looks really scary for Black. My idea was to play Bd2 and forcing black to move the knight to e7 instead of Nf6 and only then taking the bishop with the idea to follow-up with Rc1 and having an active position. Taking immediately with fxe5 is the right way though and it was even suggested from the sicilian mind. Getting this plan over the board is again counter-intuitive, but really great if you see the following astonishing move. The game continued and lasted for 5,5 hours. I made a mistake while transforming into the end game and should have lost. Fortunately, it turned out that the struggle before exhausted my opponent and I was able to win at the end when he lost his concentration for a second. That’s another point: the Morra can put a lot of pressure on your opponent as he has to navigate through a jungle of pitfalls. I hope you enjoyed the game analysis. I’m not a titled player and mainly analyzed the game with some other team mates and of course with current chess engines. Therefore some strong players might find improvements for black. There is an unwritten law that I don’t promote any opening book or other commercial content of other vendors on my website. I followed this law for the last 9 years, but today I had to make an exception. The book is really that good. I’m sure chess history will value the outstanding contribution to the chess community, which Marc Esserman achieved by his book. Many chess authorities are praising it already. Check out the Mayhem in the Morra webpage of the book. Just too some time to go over this game. That is indeed a nice Sac. I will have to pick up this book you mention and go over it. Glad to hear you liked the game!